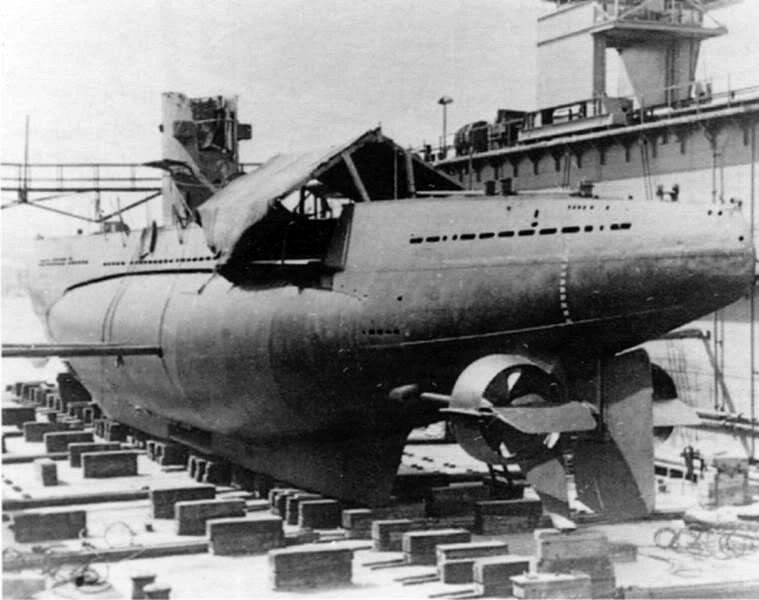 A 30th Flotilla U-boat being reassembled at Galati. The German submarine U-23, which was scuttled in the Black Sea during World War Two, is reported to have been discovered at a depth of almost 50m and videoed from an ROV by the film-crew making a new Turkish TV documentary called Blue Passion. The team, operating from the Turkish Navy’s submarine-rescue vessel TCG Akin, found the 43m U-boat some two nautical miles from the resort town of Agva. U-23 was one of six compact Type IIB submarines from the 30th U-Boat Flotilla, sent from Germany to Romania at the start of the war to attack Russian ships in the Black Sea, and later referred to as “Hitler’s Lost Fleet”. Operating in the Atlantic in the first two years of the war, U-23 had already sunk seven ships including two warships. In 1941, along with the five other U-boats, it was sent in sections along the River Danube to be assembled at the Black Sea port of Galati, and after that was based at Constanta. The transport strategy came about because accessing the Black Sea via the Bosphorus would have violated Turkey’s neutrality. U-18, U-19, U-20, U-21, U-22 and U-23 between them went on to sink some 45,000 tons of Russian shipping over the next two years, although three of the submarines were lost in action. However, when Romania joined the war against Germany in 1944 and the Russians pushed forward the commanders of the surviving three U-boats were ordered to scuttle them. U-23 was sunk on 10 September, after which the crew were arrested and imprisoned. Turkish wreck-hunter Selcuk Kolay reported that he had located what he believed to be U-23 in 2008, when he also succeeded in finding U-20 at a depth of 25m. If the identity of U-23 has now been confirmed that leaves only U-19 to find, although that vessel is believed to lie far beyond normal scuba-diving depths.